Naoshima isn’t a very well known island for most people, but if you are into art, and especially modern art, Naoshima is the place to be in Japan. It is an island that has embraced art and made it the number one attraction on the island. Access to Naoshima is relatively easy. 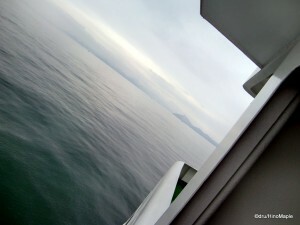 The most common route is to take a ferry from Uno, near Okayama. Since this is on the main island of Japan, and the easiest way to get there from the Shinkansen, it is also the busiest way to Naoshima. However, from Shikoku, you can catch a ferry from Takamatsu, which takes less than an hour. Travelling to and from Naoshima is an interesting adventure in itself. Naoshima is located near several other islands, and it is near a busy shipping lane for Japan. Upon arriving in Naoshima, you will more than likely enter the main port. This area is Miyanoura. 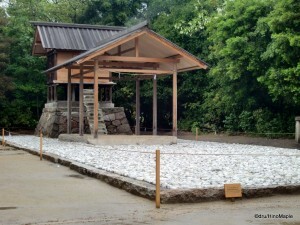 It is a tiny area which gives a glimpse into what Naoshima is about. From here, you’ll have two choices, to either rush onto the bus, or look for a bicycle rental shop. The day I visited Naoshima, it was raining on and off, so I decided to take the bus. Do note that the bus drivers speak minimal English, at best, but they can help you with the very basics of buying a ticket. 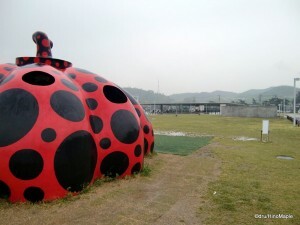 If you have a little time, a quick trip to a giant red pumpkin at the port is worth a visit. You can literally walk inside. There are two pieces of art around the ferry terminal that is sure to wet your appetite for what’s to come. You can also walk over to the “007 ‘The Man with the Red Tattoo’ Museum” which is only a few hundred metres from the terminal. This is not worth visiting unless you have extra time waiting for the ferry as it comprises of just one room with only a few pieces of James Bond memorabilia. 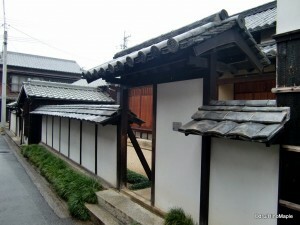 The easiest place to visit is the Honmura district. This is the location of the “Art House Projects”. It is a collection of 7 homes that were designed by artists. One of the homes requires a reservation in advance, but the rest don’t. There is a 1000 yen fee to visit all of the homes and you will get a very nice souvenir listing the homes and a map of the Honmura area with locations of each house. If you are taking a bus, make sure you get off when you see the school and post office. It will be on the right. It is very easy to miss, but it’s the best starting point. You will be located very close to “Haisha”. This is a very interesting house that was built to look derelict. It is a collection of trash that was formed into a two storey house. It was by far the most interesting house, in my opinion. “Ishibashi” was the second house I visited and it was a nice place. Inside the house, it was designed to look like a waterfall. Without pictures, it is impossible to give a good description in only one or two sentences. It was a nice place, but too easy to forget. “Gokaisho” is another easy to forget place. It was nothing more than a couple of shacks, albeit extremely nice shacks that faced a beautiful stone garden. Of course you couldn’t walk into the garden, but you could sit down and enjoy the peacefulness of the garden. “Kadoya” had the most interesting message. Throughout the house, there were digital numbers counting up or down and at different speeds. It provided a very surreal experience. If I had more time, I would have liked to stay even longer. “Minamidera” was more interesting outside than inside. It was an interactive house of darkness. You are taken inside a pitch black room where you have to wait for about 5 minutes while your eyes adjust. After that, you’ll be able to faintly see a screen with fog, which you can walk up to. It’s not very interesting, but something that’s worth a visit. The last house was “Go’o Shrine”. This one wasn’t difficult to find and it was fairly beautiful. However, finding the entrance to the inside was more difficult. There is a hill next to the sea where you can walk down. Then, you have to walk through a thin concrete hallway till you are under the shrine itself. It provided a very peaceful experience that was even better because very few people were on the island when I visited. After visiting Go’o Shrine, you can also take a quick look at some castle ruins, but be warned, there was nothing but garbage in the area, so you shouldn’t feel a need to see it. The area is very small and easily accessed on foot. Do note that it’s a little difficult to find each street and the map makes the town look much bigger than it really is. The Benesse area is located along the south cost of the island. If you rent a bicycle, it is probably the first place you will visit. Otherwise, it is the last few stops on the bus route. 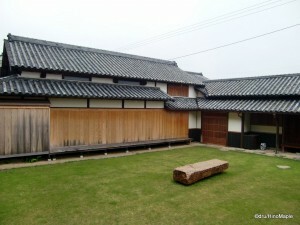 There are two museums, the Chichu Art Museum and the Benesse House. I didn’t enter the Chichu Art Museum due to the cost, and my lack of real appreciation of modern art. I did enter the Benesse House where I got a map to the outdoor exhibits. The Benesse House is a small modern art museum that took me less than an hour to look through. It wasn’t as impressive or breathtaking as I was lead to believe, but if I do go back, the Chichu Art Museum is on my list. I was told I missed a very important museum. The main attraction in the area is the outdoor works of art. There are 18 works and they are all free to see. You can get a map from the Benesse House, and maybe the Chichu Art Museum. Although they are scattered throughout the area, from the Chichu Art Museum, past Benesse House, and out to a fishing port, the majority are located in clusters. One set is located near Benesse House, and it’s a little difficult to find the entrance as there are no signs. This makes it more interesting. Along the beach, between Benesse House and the fishing port is the second cluster. The beach is where the most famous piece of art on the island is held. 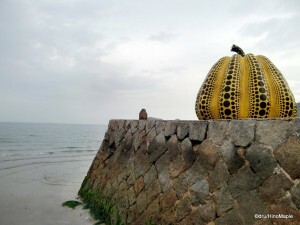 It is a giant pumpkin located on a small pier. It provides a great beacon for anyone on the water, and an even better photo opportunity for travellers. While I don’t get the entire message of the art, it was something I had to do on the island. Naoshima is a great one day adventure from either Okayama or Takamatsu. While most people recommend a day and a half, staying overnight at the Benesse House is extremely expensive, and the other accommodations are difficult to book. Language can be a problem, but most people who work for the Art House Project, the Museums, and the Ferry Terminal all speak minimal English. They can help you get tickets and find your way, even without English. Just smile, speak slowly, and say “arigato”. Naoshima is also part of a series on Naoshima. Follow the links below to read more. This entry was posted in Setouchi Triennale, Shikoku and tagged 007, Art House Project, Art House Projects, Benesse, Benesse House, bicycle, bicycle rental, Chichu Art Museum, ferry, ferry terminal, fishing port, giant pumpkin, Go'o, Go'o Shrine, Gokaisho, Haisha, honmura, house, Ishibashi, island, James Bond, japan, Kadoya, Kagawa, Kagawa-ken, Man with the Red Tattoo, miyanoura, modern art, museum, Naoshima, Okayama, outdoor art, outdoor art exhibit, pier, port, pumpkin, Shikoku, Shinkansen, shrine, terminal, Uno, 四国, 宇野, 岡山, 日本, 直島, 英語, 香川 by Dru. Bookmark the permalink.